You are not logged in. [Log In] Pond Boss » Forums » MANAGING AN EXISTING POND » Evaluating and adjusting fish populations » Do I need some better genes? #129356 - 08/15/08 09:30 AM Do I need some better genes? I've caught plenty of 10" BG but they don't have that nice saucer shape that many on the forum have. Do I need better genetics? Here are some pics before I upped the protein. Without seeming negative...I see what you mean. I've got plenty of fish that look just like that--even in the production ponds with CSBG, but I'm looking to up the numbers of the "saucer shaped" fish that you're referring to. Most ponds that I fish, or check on, have fish with the bigger head/body ratio like you've got in your pics. These are healthy fish, that can get really nice sized, but I suspect that they are older fish, with a little less top-end potential. I've always thought that fish that looked like yours are healthy, fun, great-tasting etc., but if I have a feeder set up I will see the taller, better Wr fish near the feeder. I think you can start selecting fish for eating/harvest by differentiating which fish have the better Wr's and harvest the fish with lower values. My gut instinct is to say that you don't have any type of problem, and just need to start being a little more intense in your selection process. It's all about stacking the odds in your favor, and that's one way to do it. How old are your BG? They may not be old enough to have have all the male characteristics yet. I suppose it takes longer in cooler climates. I dont know. It seems that the groceries have been lacking for a little while RGT these fish. At 10 inches, shouldnt they have weighed more at one time? Any weights,Ryan? If Bruce says he has some that look just like that, it would be a great relief to me. As they say, you have to eat some of them; they look like prime candidates. Ryan -- one other possibility. 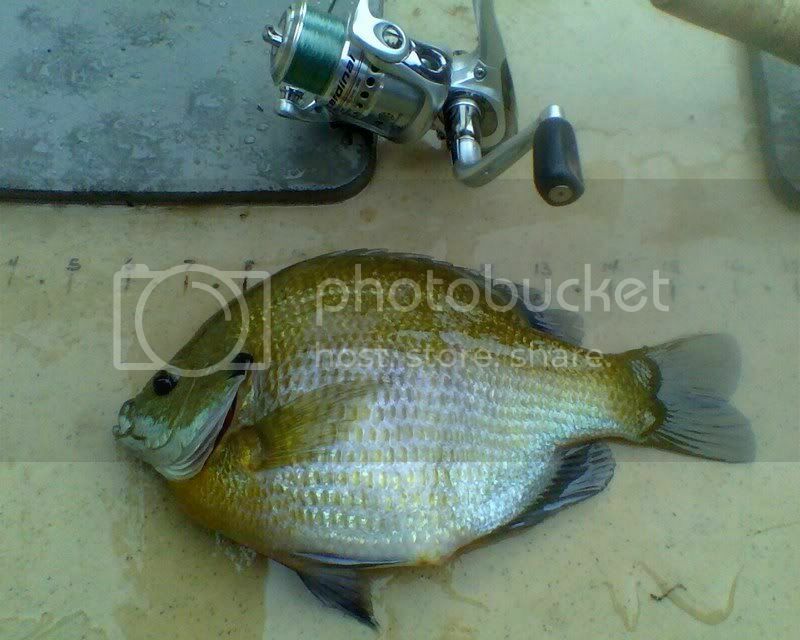 There's been at least some thought that there are two body forms for bluegills. One is the saucer shape, and the other is more streamlined. If a bluegill lives in submergent vegetation, the saucer shape would be better for avoiding predators (fast turns) and feeding. If a bluegill lives in an open-water environment, then the longer body shape might be better for predator avoidance (faster). Actually, that speculation is the easy part. Now, the hard part: is it genetics, or is it an adaptation to the environment (meaning that all bluegills have the capability to go "either way" depending on the habitat in which they live)? I have not seen an answer to that one. This should start some discussion, eh??? Whoa! This gives me something really cool to put in http://www.bigbluegill.com ! Is there a something I can draw off of to put together a little article? I'm sure I could take the bluegills above, and have Bill Coddy put them in a combination slide with a couple of Bassandgrass or Theo's crazy saucers. Dave that is news to me. I have not seen that written. I need to check. Where did you get that bit of info. It is so simple and makes so much sense that it plain never registered. Uggh. 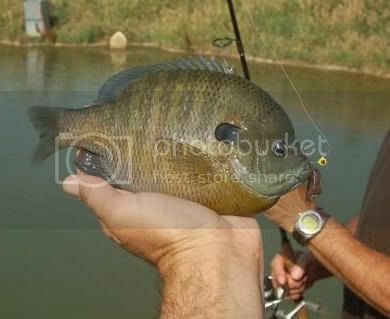 OK, Bill here's your challenge (If you choose to accept it--I'll do the rest) of putting four bluegill in a slide. The top two will be Dr. Dave's saucer variation, and the bottom two will be Dr. Dave's streamlined variation. 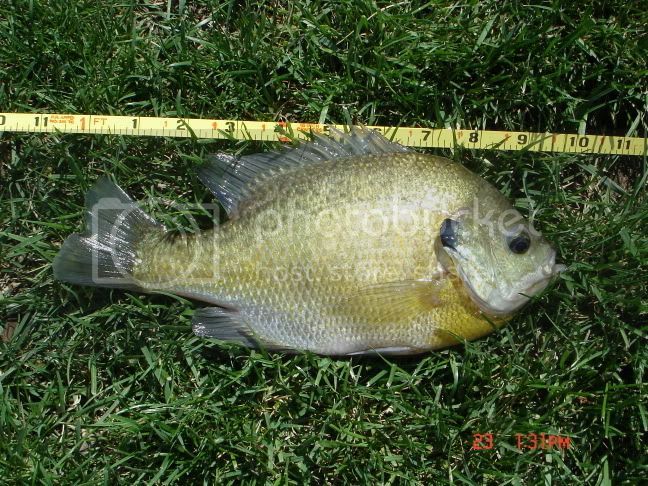 All four bluegill are large specimens of around ten inches, so we've got some consistency in overall mass. Why do my best BG look like saucers, when my pond has NO weeds? Another mystery to figure out. Theo, I think your current dominant body morphology would be more a function of what happened for the last several generations in whatever facility or location that they came from. You haven't had enough generations to begin to match up with your pond's particular situation. Anyway, you're the dominant predator right? Ewest -- I heard it from some of the Illinois Natural History Survey biologists. Same crew that really increased the recognition of the bluegill cuckoldry. Don't know if anything is in print or not. Will find out next week after we get back from the AFS meeting in Ottawa. Bruce -- will see if I can get some "hard" documentation and not just this speculation. Theo -- I never said it was true. 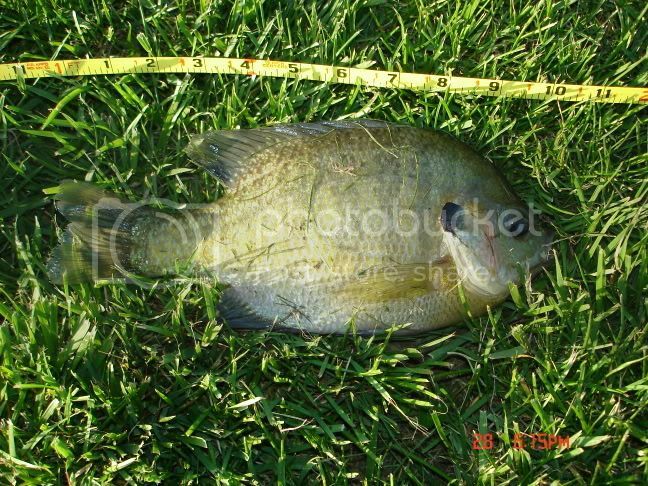 I have seen some instances where it seems to make sense -- like when you still produce 10.5 inch bluegills, but they are longer (like in one of our nearby lakes that is large, shallow, and no plants). By volume or mass, yes, whether you're looking at BG removed or predator size (215lbs to 10-ish for the big CC). Where do you draw the line between adaptation and genetic change ? Long term adaptation is the genesis of original genetic change. The catalysis can be man , weather , geologic change etc. 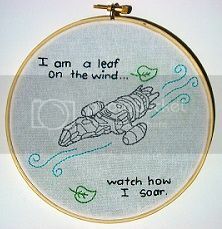 The pictures I posted were from June of 2006 and probably recently spawned out. The fish were likely 4 years old assuming the fish I stocked were 1 year old. At the time the photos were taken, I was feeding Purina Gamefish Chow once a day by hand. I switched to Aquamax 400 a few months ago and my fish seem to be a little heavier. There are no weeds in the pond and limited manmade structure (pallets, sputniks,brick pile, and field tiles). In my case, these are a result of the stocker genetics since the pond was built in October of 2002. Bluegill I've caught from lakes near my house are even more streamlined than those in my pond and vary from weed choked and shallow to nearly structure free. Dave Willis, your natural selection theory is interesting. I was thinking along the same lines but just the opposite. Wouldn't a more saucer shaped bluegill be harder to swallow than a streamlined one? 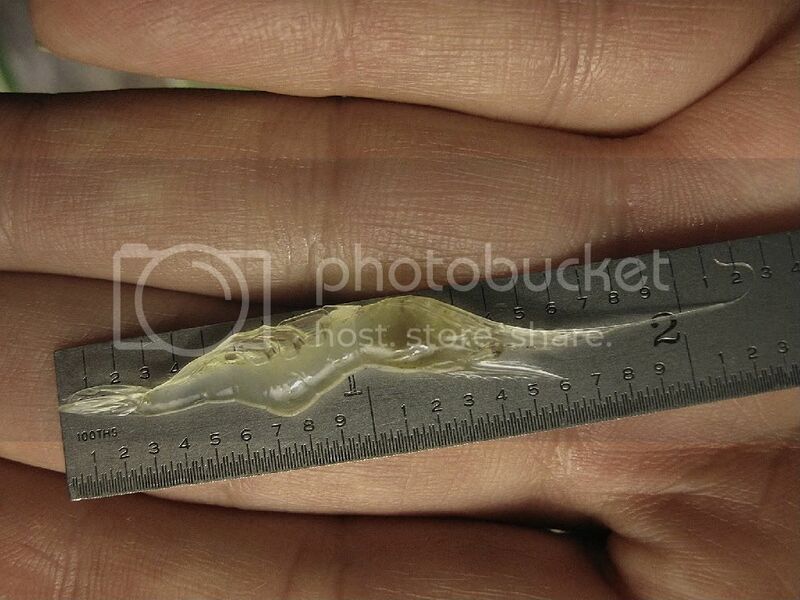 Based on the pictures, would multiple per day feedings of my existing fish grow them to dinner plate proportions or should I search further to get BG with the genes I am looking for? The two fish suppliers within reasonable distance of me have fish like the ones I posted. Ryan -- you sure make a good point. I think the "thought" on this one is that the saucer (compressed) shape is best for quick turns in vegetation, and avoid predation by quick movement and hiding. In open water, the streamlined body shape would be fast, and the streamlined ones would outrun the saucers, leaving the saucers behind to be eaten first?? I sort of took us down a tangent here -- one of those stray thoughts that pops into the brain. We do NOT know how or if genetics are involved, or even if this is all true. 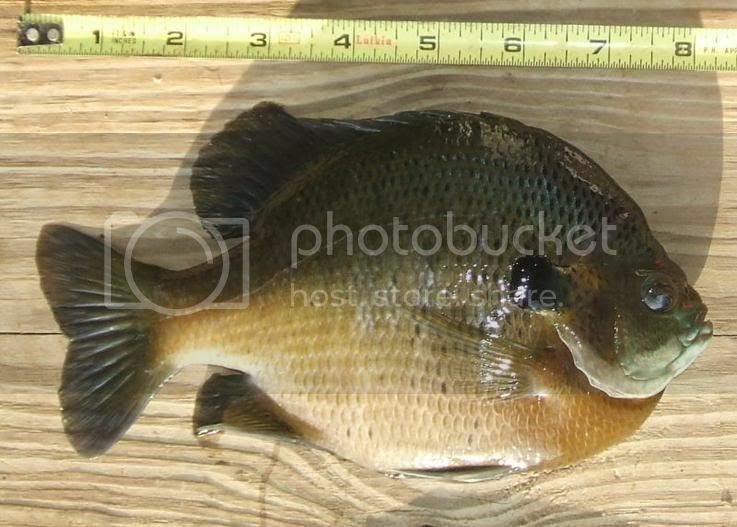 Maybe all bluegills have the option to go to either form of body morphology? Thus, I think that I sure would try the feeding program first?? Guys?? Other thoughts for Ryan? I think you're right Dave. I don't think a bass would care what shape it was as long as it could catch it. 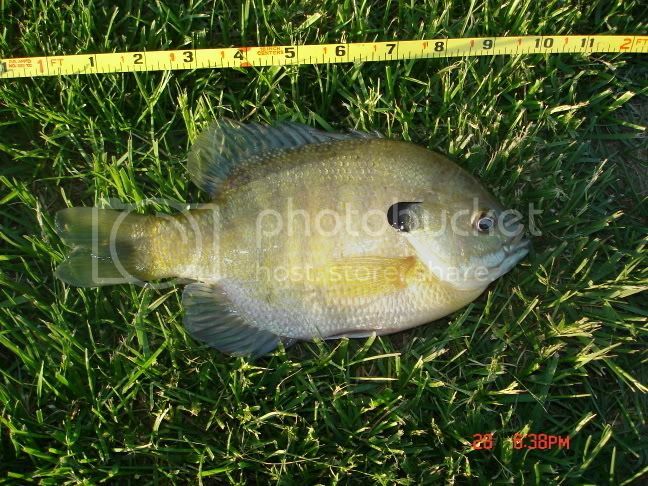 Maybe all bluegills have the option to go to either form of body morphology? IMHO I think the different body shapes are indicative of both the amount of food available present and the amount of competition for those food resources over the course of a fishes lifestime. BG growing up with little competition and lots of food will be more saucer shaped. BG with more competition and fewer food resources will be more streamlined. There are also similar body shape patterns with LMB in terms of shoulder hieght and girth. My guess is that if you aged both the streamlined and saucer shaped BG you would find the saucer shaped BG to be significantly younger than the streamlined ones of the same length. That's my opinion and I'm sticking to it until more research has been done. This should be a good discussion. To much competition for food and BG stunt. I would guess that most of the observations that Dave based his comment on were from natural lakes not ponds with supp feeding. BG food size and variety (absent pellet feeding ) is so diverse that while some (small ones) are stunting in one age class others of a different age class (big ones) are getting very fat (some streamlined and some saucer shaped). George has a bunch of saucers and no weeds IIRC. I have some weeds and a lot of open water and have some of both body shapes. What do you guys see in your ponds (weeds or not and results - saucers or streamline or both) ? Shorty I will start the research. What do you guys see in your ponds (weeds or not and results - saucers or streamline or both) ? The fatter my BG are, the more they look like saucers. Skinnier BG (which tend to be shorter also in my pond) are more streamlined. I have always thought it was a function of how much they were getting to eat - fat, fast growers are saucers. P.S. To reiterate, pond is almost weedless. Hi guys. I'm in Ottawa at the American Fisheries Society meeting. There is a poster here on pumpkinseeds and their body morphs. That work talks about four body morphs for pumpkinseeds. One set is flowing water (streamlined) vs. standing water (compressed/saucer). The other split they had was littoral (shallow,nearshore/saucer) vs. open water (streamlined). Ewest, they cited two papers if you want to try and find them. Bruce -- after we track down these papers, we can see if they also cite any bluegills papers on body morphs. Theo, I'm still not sure how they separate condition/feeding from supposed morph. Could the different morphs be aged? I suspect that an 8" sacuer shaped BG is significantly younger than an 8" streamlined BG by at least one year.